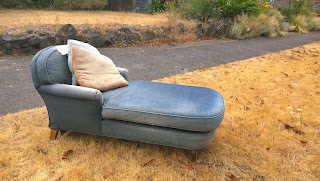 Corner of 49th and 1st in Fremont: a blue fainting* chaise on very brown grass and dandelion seed heads. Whether you want this piece or not, you must admit it speaks to our summer this year in Seattle with blue skies (chaise color), high temperatures (fainting weather for Seattleites), and little rain (parched lawns). If only the donor had included a fan. * Always thought this was "feigning couch" as in someone who uses it is pretending to be affected by something.